December 27, 2010. On Christmas night, in the freezing cold before the blizzard hit New York City, crochet artist Olek and her band of enablers managed to fully clothe the famous bronze statue of a charging bull that stands in Bowling Green Park in downtown Manhattan. 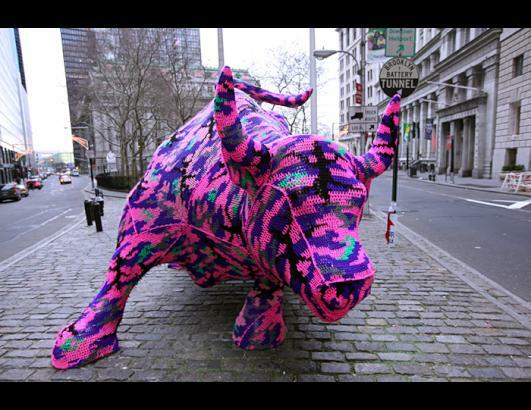 A potent symbol of Wall Street capitalism, the bull wore its crocheted "cozy" for two hours before the caretaker of the small triangular park arrived and confiscated the work, cutting it up and depositing it in the garbage. But first this photo was taken. "Greater New York" is one of the most influential exhibitions for young and emerging artists presented in the city. In this, its third edition, the number of participating artists is reduced to 68 from nearly 200 in the 2005 version. Artists were given more room to construct environments and installations that represent the creative processes and its juncture with life. Glimpses of works by David Brooks, Franklin Evans, Lucy Raven, Hank Willis Thomas, Sharon Hays, Ishmael Randall Weeks and others are visible. Guest crucifixion by Jerry Saltz. James Kalm believes in the serendipity of fate, and sometimes, despite the best laid plans, ends up turning on the camera and capturing intriguing happenings. Such was the case when he popped into view a debut exhibition by Trudy Benson. The artist uses thick slabs of oil paint in coloristically rich pictures that verge on relief. Trudy discusses her "fetishization" of paint, and her painterly influences in a brief chat. Heading east we visit NURTUREART to partake in the opening of "Who's Afraid of Ornament?" curated by Natasha Kurchanova. This show investigates decoration and ornament and bares testament to the reemergence of the Pattern & Decorative movement from the late seventies. James Kalm schmoozes his way into the exclusive private debut of Ed Keinholz's installation "Roxys". This major piece is an artistic representation of a classic brothel. The interior space is populated with sculptural elements and period furnishings. James Kalm returns to the scene of the crime. After being removed from the press list for the 2008 Biennial, and the subsequent getting busted by security and recording of that show on the down low, it seems the Whitney has decided to include the "Kalm Report" as a reputable member of the press for 2010's edition. This exhibition, curated by Francesco Bonami and Gary Carrion-Murayari, is touted as a national cross section of the most important and historical art produced during the past two years. 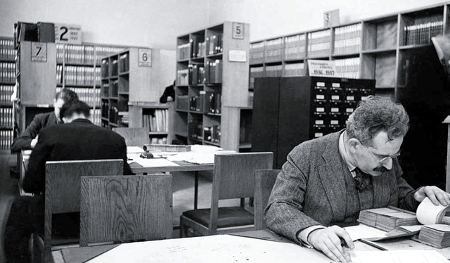 Part I features the introduction by Adam Weinberg, and a walk through tour of the fourth floor. premiers at PULSE Miami 2009, December 3-6. For those of you that will be taking part in this years 2009 Art Basel Miami Beach / Miami Art Week, another art machine spectacle to be sure not to miss premiering at Pulse Maimi by fellow PAM conspirators the Artists Meeting Arts Collective. Looks like they are trying to undercut everyone and sell out. James Kalm braves fall showers and trains his way to the Bowery’s New Museum for the first major museum exhibition by Urs Fischer. Lionized as one of contemporary art’s most distinctive talents, Fischer earned the New York spotlight in 2007 by cutting a hole in the floor of Gavin Brown’s Enterprise and digging out tons of dirt leaving a gaping crater for visitors to climb into and explore. As an astute observer of spatial perception, and a master of digital technology with a mischievous sense of humor, the artist uses the most advanced commercial printing techniques to tweak space and challenge “reality”. James Kalm climbs to the top of the pile of tires in this “reinvention” of Allan Kaprow’s Yard at the debut exhibition of Hauser & Wirth New York. William Pope.L adds his own narrative text using a Barack Obama imitator, and flashing lights in this restaging. Upstairs we tour an in depth collection of posters, prints and documentation tracing the historic arc of this “Happening” which was originally created in this very location in 1961. After 42 years of living in the New York Art World, and 9 years working in it, I have decided that it's time to put up a shingle. I'm opening a new art project space in Williamsburg under the name PLAYSPACE. It's located at 38-C Marcy Avenue, entrance on Hope Street, three short blocks and around a corner from the L train at Lorimer Street.